Shareholders of Transcorp Hotels Plc, have approved a final dividend of N1.14 billion for the 2018 financial year. The final dividend which represents 15 kobo per ordinary share, is a 20 percent improvement over the 12 kobo per ordinary share paid for 2017. The shareholders who approved the dividend at the company’s 5th Annual General Meeting (AGM), also praised the company for its impressive financial results for the year ended December 31, 2018. He further stated that good corporate governance and the presence of a focused management team who are concerned with giving returns to shareholders are some underlying factors behind the company’s continued success. The company in its 2018 full year results reported a 26 percent increase in turnover, of N17.4 billion from N13.8 billion recorded in 2017. It grew profit after tax by 37 percent or N1.0 billion to N3.7 billion in 2018 compared to N2.7 billion in 2017 and increased profit before tax to N5.0 billion from N3.7 billion in 2017, depicting a 35 percent year on year growth. 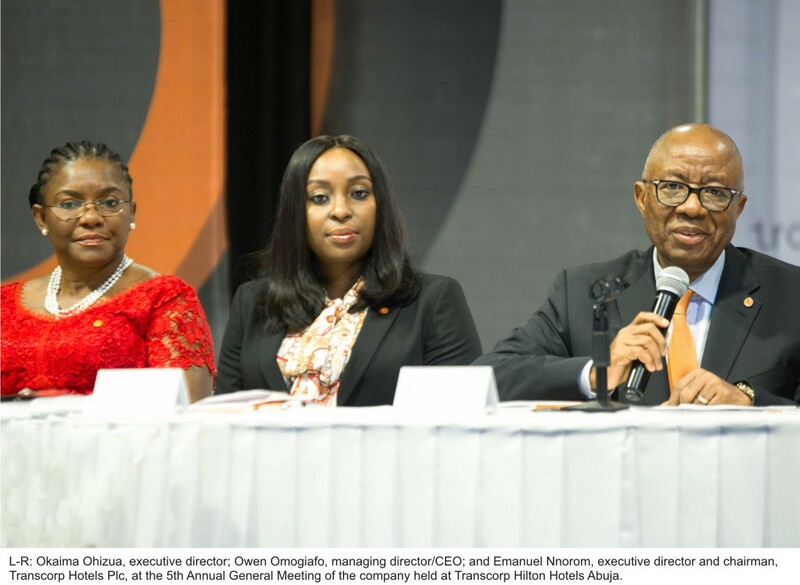 According to Emmanuel N. Nnorom, chairman of the company’s board of directors, the company’s growth milestones is an unprecedented achievement in the history of the company. “It is a further demonstration of our ability to adapt quickly to a changing business environment while keeping pace with global best standards in hospitality,” the Chairman said while thanking the Shareholders for their continued support and faith in the Board and Management of the Company. Owen Omogiafo, Transcorp Hotels managing director/CEO, reiterated the company’s commitment to quality and global standard customer experience, drawing on the varied international awards conferred on the Company. She further said that growth and efficiency underpinned by a strong culture of service excellence and cost optimization will drive the company.